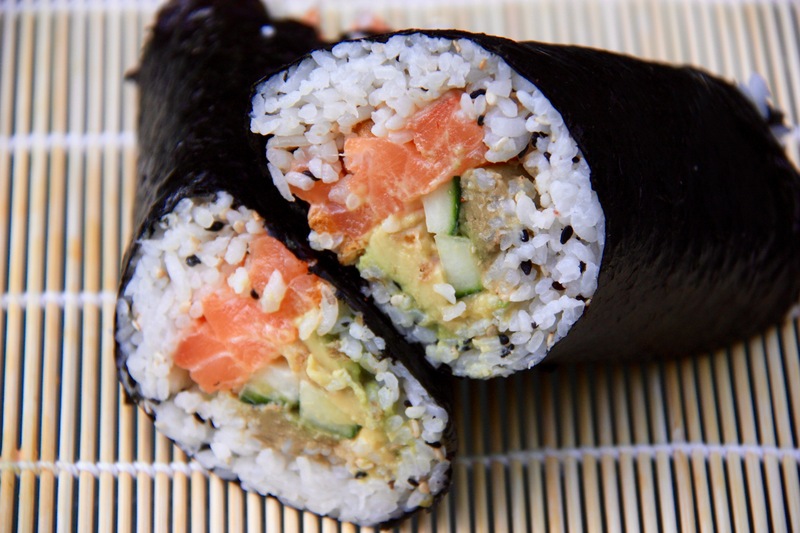 Sushirrito- the newest food hybrid that is taking over Instagram. Combining recipes from Alton Brown for the sushi rice, tempura bits from The New York Times, and watching countless youtube videos, I attempted this difficult feat and managed to create a sushirrito of my very own. This is the perfect recipe to try with friends or family if you’re in the mood for a messy and fun activity. It is also super delicious! Once your rice has cooled to room temperature, add the remaining ingredients and stir to combine with a spatula. For the mayo, combine the two ingredients. If you like it extra spicy, add more Sriracha. For the tempura bits, whisk together all the ingredients and pour into a squeeze bottle. Pour oil in a heavy bottomed pot, about an inch high and preheat to 350 F. Squeeze strands of batter into the oil and fry for 30 seconds or until golden brown. Remove using a slotted spoon or strainer to a plate coated with paper towel. To assemble the sushirrito, lay a sheet of nori onto the bamboo rolling mat. Layer half of the rice onto the sheet, leaving an inch on top empty. On the side closest to you, add half of the avocado, cucumber and salmon and sprinkle with tempura bits. Drizzle the mayo on top. Holding the edge with the filling, carefully roll, using the mat to guide you. When you have rolled all the way to the end, you will see that the roll will not close because it is so fat from the filling! Take another nori sheet and wet it with a couple drops of water to help it stick. Cover the remaining part of the roll and seal it around the edges. Trim if you have any excess nori. Cut the sushirrito on a diagonal bias. Repeat to make another sushirrito. Try other traditional fillings like tuna, shrimp or crab to make it your own perfect sushirrito.